The most common cause of vertebral facture is osteoporosis, osteoporotic fractures predominantly affecting the hip, wrist and spinal column. 16% of women and 5% of men will suffer from symptomatic vertebral fractures at some point in their lives, but in women over age 65 this percentage may rise up to 40%. Osteoporosis is the loss of bone density, thus making the bone tissue weaker and more susceptible to collapse or fracture. It is often called a “silent disease” because bone loss occurs without symptoms and is completely normal to develop it as we age. Osteoporosis is, however, promoted by a lack of physical activity and by the loss of hormones after menopause in women. It happens in men too, but with a lesser severity and a much later onset. The fragility of the bone makes it more susceptible to collapse, thus producing vertebral compression fractures and the front part of the vertebra to become wedge-shaped. Over time, vertebral collapse becomes multiple (affecting more than one vertebra) and progressive, thus causing local pain, which is what most bothers the patient, and progressive deformity of the spine, which bends forward (kyphosis). These fractures are the most common out of those caused by osteoporosis; in fact, their incidence is twice that of osteoporosis-related hip fractures. It is estimated that almost 50% of women and 25% of men will experience some type of osteoporosis-related fracture at some point in their lives, and half of all osteoporosis-related fractures will involve vertebrae. Only in the European Union 450 000 new cases are diagnosed per year, and though in 2000 there were already 23.7 million patients with osteoporotic fractures, the incidence is expected to continue rising as the proportion of people over 65 years rises, and it is estimated that 27.2 million were affected on the year 2010. Diagnosis is carried out by means of clinical examination and a neurological exam. It is then confirmed using neuro-imaging tests (spinal column X-rays, CT scan, MRI scan). WHAT ARE THE CONSEQUENCES OF AN OSTEOPOROTIC VERTEBRAL FRACTURE? Once the first of this type of fractures appear, the risk of others happening increases by a factor of 5. As more fractures appear, the spinal column loses height and leans forward (kyphosis), resulting in a reduction in the size of the chest cavity and, thus, the lung capacity. This is why the incidence of lung disease increases by 210% with respect to the population of the same age but with no such fractures. At the site of fracture there is often pain, thus inducing more sedentary attitudes, which promote osteoporosis. The compression of the abdomen due to the kyphosis produces a decrease in appetite, for the patient feels full before, favouring malnutrition and so further promoting osteoporosis and closing the vicious cycle. In addition, sleep disorders, anxiety and depression are common. Overall, all these factors result in an increase in mortality by 23-34%. Sudden pain in the spinal column that appears either spontaneously or after minimal trauma. Forward bending of the spine with prominent abdomen. HOW ARE OSTEOPOROTIC VERTEBRAL COMPRESSION FRACTURES TREATED? Eliminating the pain of the fracture area. Breaking the vicious circle that leads to an increase in morbidity and mortality. Patients with chronic back pain due to a vertebral compression fracture. Limitations in motility with no possibility of leading a normal life. Failure of conservative treatments (rest, orthesis, analgesics). Patients under age 18 affected by metabolic disorders or subject to prolonged use of corticosteroids. Traditional medical treatment involves bed rest, analgesics and orthesis. It does not control pain and does not contribute towards correcting the kyphosis, so it does not break the vicious circle that leads to an increase in morbidity and mortality. These fractures are not susceptible to surgical treatment, for the interventions would have to be extremely aggressive to be able to correct the kyphosis and their results are poor on osteoporotic bone. These fractures cannot, either, be reduced and stabilised by fixating a metal scaffold of screws and bars, because, due to the weakness of the bone, the screws loosen and the system is disassembled. Percutaneous vertebroplasty is a short, minimally invasive surgical option with the objective of relieving the pain, as well as reducing and stabilising the fracture, restoring spinal column anatomy and thus allowing daily activities to be resumed. It involves inserting a needle through the skin to inject polymethacrylate (PMMA), commonly known as acrylic bone cement, to reinforce the vertebral body. In cases of multiple fractures, it can be applied at various levels in the same surgical intervention. Balloon kyphoplasty is designed to strengthen the collapsed vertebra and correcting the kyphosis as much as possible, but reducing the risk of an acrylic bone cement leak during injection, which is much more common in vertebroplasty. In addition, percutaneous vertebroplasty strengthens the collapsed vertebra but does not correct the kyphosis because it does not correct the wedge-shape of the front part of the vertebra. A small amount of time is usually required to carry them out. They can be performed under local or under general anaesthesia. No orthesis (external bracing, corset) required. Daily activities resumed in a shorter amount of time . Continuation of the long-term management and treatment of osteoporosis by the primary care doctor. Osteolytic lesions, e.g. vertebral hemangioma. Primary and metastatic tumours of the spine, including multiple myeloma. 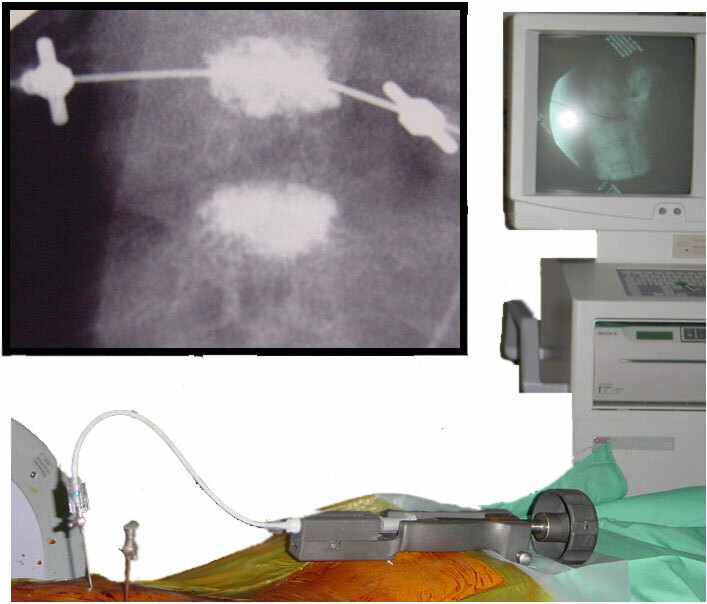 WHAT WILL HAPPEN DURING A PERCUTANEOUS VERTEBROPLASTY? A trocar, 2mm in diameter, is inserted at the pedicle of the vertebra, reaching the collapsed bone tissue. Once there, the acrylic bone cement can be directly injected, strengthening the vertebral body, or a special balloon, which lifts the compressed bone tissue on inflating, can be introduced (though in this case the procedure would no longer be a vertebroplasty but a balloon kyphoplasty) and then the acrylic bone cement injected. To treat the pain, however, just injecting acrylic bone cement is enough. In any case, the cement is injected under close radioscopic control to be able to direct exactly where the cement goes and prevent complications. Ideally, the procedure should be carried out as soon as possible, as this allows the best chance of recovery. In most cases, the goal is only to stabilise the symptoms and to alleviate the pain as much as possible. Patients that have had one vertebroplasty may require more in the future at the same or at other levels of the spine. After surgery, the patient must remain for a while in the area of post-anaesthetic recovery until the acrylic bone cement hardens (about 5 minutes) and then return to their room. Usually, the pain in the area of the fracture diminishes or disappears after the procedure, leaving only the temporary discomfort due to the puncture(s) on the back.